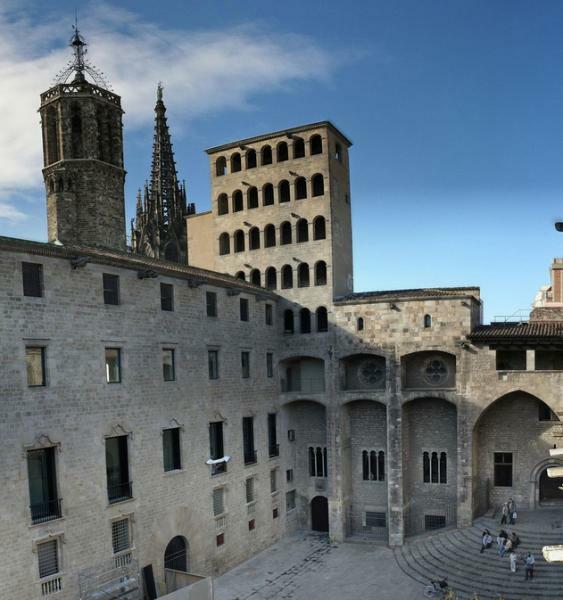 Handsome Plaça del Rei started off as the courtyard of the Romanesque-Gothic Palau Reial Major, a palace begun in the 10th century for the counts of Barcelona and expanded when they became the kings of Aragón. It's a remarkable composition, eccentric, asymmetrical and designed to impress; nothing sums up better the edgy, strangely modern world of medieval Catalan architecture. Edgiest bit of all is the completely unique Mirador del Rei Martì on the left (1557), looking for all the world like a skyscraper of the 20th century. Besides jousts, the square would make a perfect setting for an opera, and it is often used for summer performances. But at least once its picturesque fan of steps saw real drama, when Ferdinand the Catholic (never a favourite in Barcelona, after he wed Isabel and subjected his own kingdom to Castile) narrowly escaped having his throat cut by a disgruntled peasant. Like most squares in Barcelona, it has a new work of art: Eduardo Chillida’s Topos (1985), looking like a giant safe. The palace buildings around the square are now part of the Museu d'Historia de la Ciutat.